» Diamond Reflections: Who Is the Pitcher King? Welcome to Diamond Reflections, a video wrap-up of yesterday’s MLB action. In this post, we talk baseball, share a few laughs, and watch some highlights. Our friends at MLB.com don’t allow embedding on recaps and highlights, so for now there are just links to the video. That will have to suffice until things get a little less hoard-y. We’ve spent the extra money and bought some sections. That’s right, we’re dealing in puns here. Get ’em hot. Mashed potatoes. This section honors the most emphatic dinger. Congratulations to the Padres’ Cameron Maybin, who wins the first Tater Prize by annihilating a two-run jack into left. Honorable mention: Cincinnati’s Jay Bruce bashes one out to dead center. Anyway, this is the best defensive play, and today it belongs to the Dodgers’ Dee Gordon for this amazing get at short. Honorable mention: Scott Rolen breaks Gaby Sanchez’s heart. Some people will tell you that there’s no such thing as “clutch,” just random bits of luck that we interpret for good or ill, but those people don’t believe in magic. Me and you? We believe in magic. This is the clutchest clutch hit of the day. Take ‘er away, Austin Jackson, with your walk-off single against the Red Sox. Honorable mention: J.P Arencibia with a game-winning three-run home run in the top of the 16th as the Jays beat the Indians 7-4 in the longest season opener ever. This is a very loose reference to “the fisher king,” a character in the Arthurian legend. He was charged with protecting the holy grail from intruders, but he was wounded in the legs. Pitchers are charged with protecting home plate from the offense, and they can’t hit. It works. This, obviously, goes to the best pitching performance. 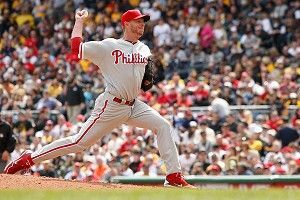 Today’s Pitcher King is Roy Halladay, who threw eight scoreless innings, gave up two hits, and struck out five with just 92 pitches. Honorable mention: Justin Verlander, who had a better line (eight innings, two hits, no runs, seven Ks) against a better offense (Red Sox), but I’m bitter that he beat the Yankees last year and I’m punishing him for the fact that Jose Valverde blew the save. We close things out by making fun of bad errors or chastising players for their lack of effort. Today, the purists among us should have nothing but scorn for the Blue Jays’ Rajai Davis, who got outfoxed by Jack Hannahan and didn’t run out a bunt in the 15th inning. Come on, Rajai! This is the bigs.